On a walk in the woods today with our local family, I thought about creativity. One definition is "the use of the imagination or original ideas..."
There are plenty of original ideas in the woods. Moss and lichens, for instance. Such intricate handwork designed by the Creator. Along the trail someone had collected and propped up a line of sticks. A creative child? A whimsical and creative adult? Whoever did it, I imagine they had a lot of fun. 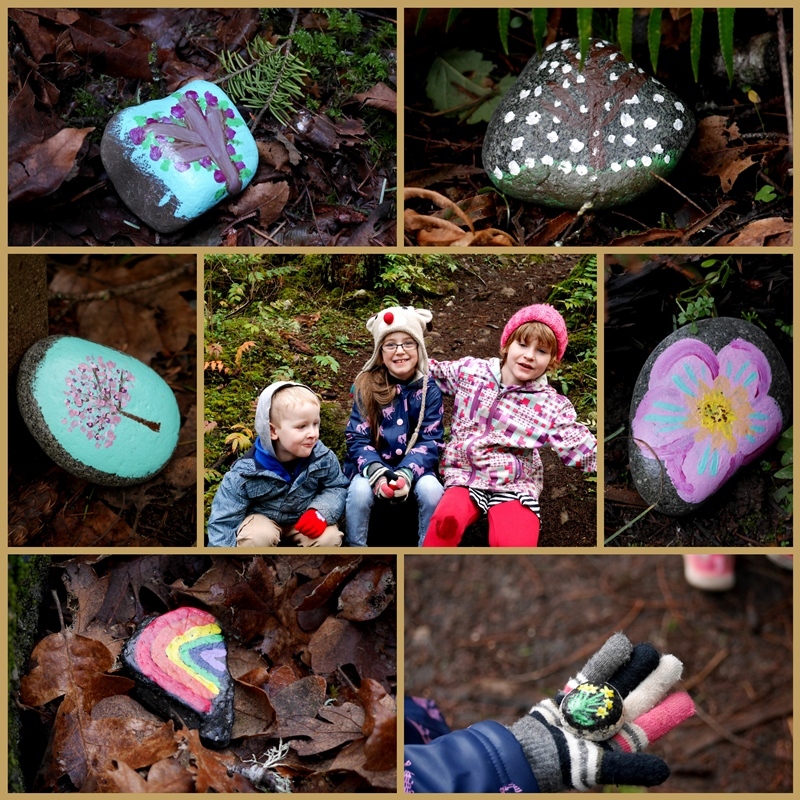 One family brought along a bag of rocks they had painted and hid them along the trail for others to find. It's part of the Sooke to Sidney Rock Hunt. toast chocolate-covered pretzels, followed by an "campfire dance". Here's another photo to give an idea of the size of this tree. Although the day was grey, and the woods rather gloomy, everyone had a wonderful time. Woods. Beach. Backyard. Lots of scope for the imagination, as Anne Shirley would say. Creativity isn't only about making something tangible, like a quilt, a meal, or a painting, but about the way we see the world. I sometimes (often) chafe at not being able to sew or garden or draw as much as I'd like to. (I love my job, too) So I try to look at, and experience the world around me as full of possibility, the way children often do. Raindrops caught in hanging moss. So lovely. An old VW lies rusting not too far off the path. Who left it there? How did it get there? Why? So many questions left unanswered as we walked away from it. I later spent some time editing the photo with a watercolour filter. Fun for me, and an opportunity to play a little. Creativity and play go hand in hand, don't you think? What do you think about creativity? How do you experience the world? Lots of beauty aĺl around us, rock planting is a fun project. How lovely to see these children using their imagination and creativity whilst at play so much better for them than sitting in a corner alone fiddling with their digital gadgets. What a fun excursion! The painted rocks made me smile. I agree that creativity can also be about how we view the world! I am entranced by this post, so other-worldly. Your grandchildren were quite like little fairies playing in the pictures. And that watercolor old car! I really smiled at the twigs lined up because in one of my favorite Richardson Wright books he advises a bouquet for the house of twigs and barks in winter. I remember trying to make one a few years ago when I first read it but I'm afraid mine didn't come off so well. I think those on the path would have made a lovely bouquet. As far as creativity goes, I saw a quote on my blog friend Gretchen's blog not long ago that said that "limitations of means" was the birthplace of creativity. That was so encouraging to me because we so often think that it takes money or constant online shopping to creatively improve our homes and that may be the easy way but I don't believe it's the genius way. Your walk through the woods where you are not only feeding your senses but leading your grandchildren to do the same is one very good way. The tree reminded me so much of times in my childhood, when we used to play in a very similar tree, making up all sorts of wonderful games. Such an opportunity for imagination. Creativity is so deeply embedded in me that I must do it. I love your way of walking and noticing the creative spirit along the way. The children's painted rocks is just wonderful. What a fun walk for all of you, Lorrie! The painted rocks are beautiful and so is your photography of God's beauty. I especially love the grands with the giant tree, and the old VW! ...I never heard of theses painted rocks (you need to understand that I live in a cave of sorts) until I arrived in Maui. They are Big! Love the VW! Lorrie - creativity can be creating something tangible, but to me creativity starts with being able to "see". It can be looking beyond the obvious to see the beauty in the smallest details, as you often document in your stunning photography. It can be imagining a world with campfires and chocolate covered pretzels and dances (how fun is that?!?) 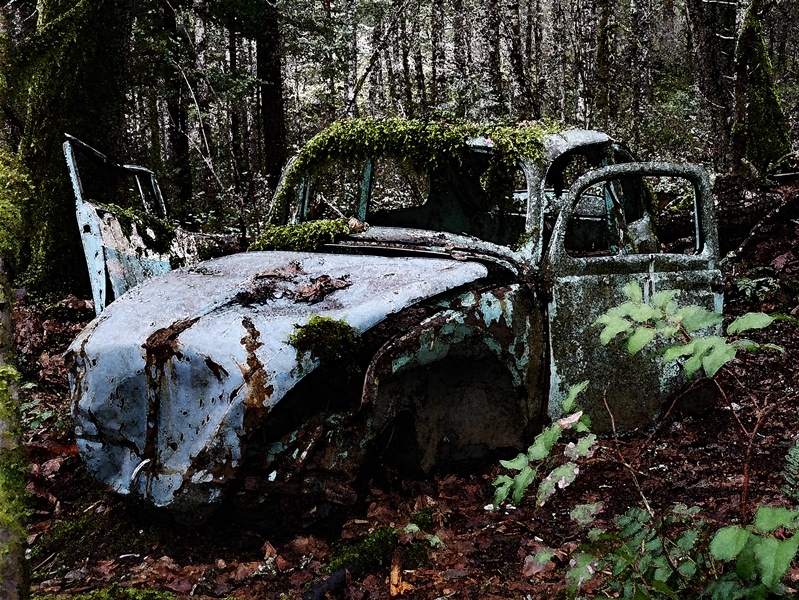 It can be finding beauty in a rusting-out car in the woods. In other words, my dear, you have creativity in SPADES. I am glad you were able to sort out the tech issues with the linky party, and we have all benefited from your joining Mosaic Monday again this week! So much fun to read your post and enjoy your creative adventure through the woods with the Children. Creativity as you have said comes in many guises. Writing can be such a creative endeavour, which is why I enjoy your blog along with the stunning photos. Hello, what a wonderful walk with your family. I love the beautiful natures scenes and images. The painted rocks are beautiful, a fun and wonderful idea. Have a happy day and a great new week ahead! This Oldtimer looks very mystical ... Happy MosaicMonday! It is so wonderful to see and listen to children at play. using their imaginations. Your woods offered many interesting experiences for them. My grandchildren also enjoy painting rocks. Thy e often make them into insects or animals. I used to love doing cross stitch and crewel needlework but my eyes could not do such fine work any longer. Years ago I enjoyed making greeting cards with rubber stamps and punches, etc, but when we moved I sold or gave away many supplies. These days think photography is a creative outlet for me --- I take so many photos with my phone as well as camera. These are great images of your walk and it looks like everybody had some fun! I think I get the most creative when I'm taking photos, trying to get a different angle or some awesome details. I think I am most creative in my everyday moments . . . setting a table, planning a party, cooking a meal, planning house projects . . . Your thoughts and images are inspiring! 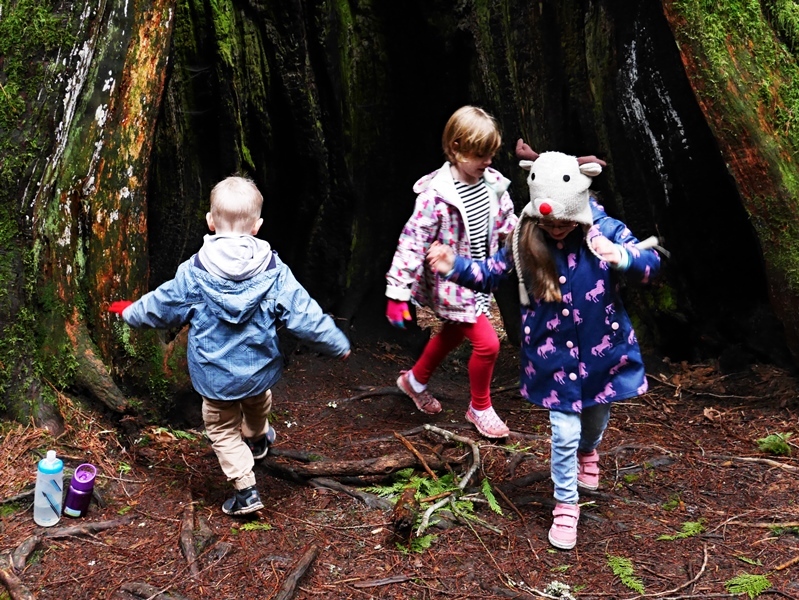 What fun the children must be having on this outing, especially in the giant tree hollow! If you like Anne of Green Gables, you must check out Anne With an E. The writing is superb, the cinematography is breathtaking, and the acting wraps me up so tightly in the story I often forget I'm watching TV. My adult daughter introduced me to the series & I have promised her that I will watch it only when we are together. What a fun walk to spark creativity! Love it. That painted rock idea is very cool. That would be a great hunt to go on. Hope your new week is going well. Such a wonderful post Lorrie - especially loved seeing the children at play outdoors, so many spend too much time indoors in this modern age. Too cold to go out right now but when it warms up I'll head to the woods to look for signs of spring. Lorrie, I love the first photo and the last one where we can see the size of that tree. I am finding it too cold to go walking these days but maybe I am being too lazy. I am planning a bit of an outing this afternoon despite the -18C. Loved the post. Sylvia D.
Lorrie, everything about this walk in the woods is breathtaking! Helps to have children along to remind us of the power of wonder! . What a magical, marvellous post, I enjoyed reading every word and seeing your amazing photographs. Loved seeing the children playing, such a delight.